It is no secret that alternative, renewable energy sources need to be utilized in this day and age. Fossil fuels pose imminent risks to the environment as well as to the health and well-being of communities of people, and they have single-handedly driven extreme global climate change in the past few centuries. However, in order to break free from America’s dependence on fossil fuels, it is necessary to understand them; their nature, chemical makeup, pros, cons, and history. The first step to overcome an illness is to understand it, and this is exactly what we must keep in mind in regards to fossil fuels. The more information we have on them, the further along we’ll be to doing away with them. For much of recent history, society has been heavily dependent on fossil fuel sources as our energy source of choice. 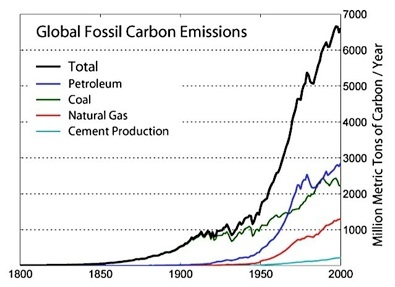 In fact, fossil fuels account for almost 80% of global energy requirements according to Robert L. Evans in his text, Fueling Our Future (2007, p.6). These fuels include crude oil, coal, and natural gas, all of which include a hefty list of advantages and disadvantages to their use. Spoiler alert: they all have one major disadvantage in common, one known as greenhouse gas emissions which drastically affect our environment in a harmful way. Let us explore each of the three major sources individually. More specifically, petroleum, which is later refined into products we use in our everyday lives such as gasoline and plastics, was formed under the ocean floor over thousands of years in a process where carbon-based life forms (this is where the term “fossil fuels” comes from) die and temperature and pressure over time cause the organic material to be broken down into simple hydrocarbon chains. These eventually form a material called kerogen, which then undergoes the cracking of the carbon-to-carbon chains and forms crude oil. The oil is then extracted and sent to a refinery, a process which yields a product with a high energy density crucial to today’s transportation, industrial, commercial, and residential energy demands. However, the environmental effects of the production and combustion of oil products is staggering. Oil refineries produce a slew of waste including rig wash (the term to describe water used for cleaning refining equipment), sweetening treatments (chemicals used during the refinement process to remove sulfur from the oil), and other oil-contaminated debris which include high levels of carbon contaminants. The combustion of gasoline produces smog and releases greenhouse gas emissions such as carbon dioxide. Effects to mitigate these problems include using algae and phytoplankton to absorb carbon from oil wastes and turning to sources such as oil sands and shale to stretch the dwindling supply of conventional oil. However, extracting bitumen (a tar-like substance that can be processed into petroleum) from these sources is very intrusive and could result in major displacement of major ecosystems, and all the while, the end product is more costly to produce. 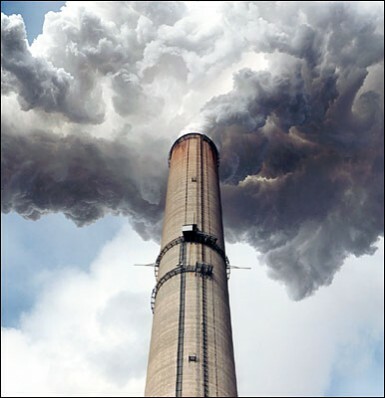 Prevalent in electricity generation and the steel-making industry, coal is the most abundant and dirtiest fossil fuel. Formed similarly to oil and natural gas, coal extraction and combustion produce an overwhelming amount of greenhouse gas emissions (nearly double that of oil and natural gas) which contribute to the formation of acid rain and a major source of climate change. However, coal is cheap and abundant, with some proved global reserves equal to about 660 billion tons. In an effort to utilize this vast supply and mitigate the effects coal has on the environment, many “clean coal technologies” are being developed such as gasification and carbon sequestration. Increasing steam temperatures within conventional plants also raises the efficiency of coal by about 4%, a modest but welcome advantage. Gasification yields a more user-friendly product due to the ease of transport and the process is much less environmentally invasive than mining. However, these technologies could increase the cost of electricity generation by anywhere from 50 to 100%, a major downside to the development of these techniques (Evans, 2007, p. 71). Natural gas is the cleanest of the fossil fuel resources, but it is unfortunately also the least abundant, with proven resources expected to last less than 60 years (Evans, 2007, p. 57). Natural gas’s main component is methane, and when burned emits significantly less greenhouse gases than either of the two other fossil fuel sources, as it does not produce ash or smog, according to Green Energy: An A to Z Guide (2010, p. 303). Natural gas is used widely in the electricity industry, for heating and cooking purposes in residential settings, and in fuel cell applications, making it the number one alternative to gasoline in the alternative transport fuel sector. Natural gas can also be liquefied for easier transport and for use in a wider range of purposes. Aside from it being less available than other fuels, the main disadvantage to natural gas is its storage, which can prove difficult and sometimes hazardous unless it is first liquefied. There are similar struggles in its transport. Most notably, an increasingly common natural gas extraction method is hydrofracturing, or “fracking,” in which huge volumes of water are injected with silica and various chemicals at high pressures into the earth to fracture shale rock formations and extract the methane trapped there. But this process is increasingly controversial due to its various environmental impacts on land use in rural areas as well as on air and water quality. Knowing the nature and uses of fossil fuels is crucial to finding alternatives. Each has their advantages, but they come at an extreme cost. If we can break away from using fossil fuels, which may be the only option in coming decades when the supply becomes extremely low, we will see major improvements in the quality of life for all living things on earth.